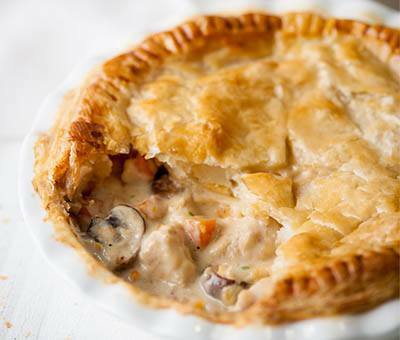 Comforting chicken and mushroom pie for a wholesome family meal. Preheat oven to 200C (180C with fan) gas mark 4. Heat the oil in a large saucepan and add the onions, cook until sweet and soft. Add the chicken and brown on high for 5 minutes. Tip in the rest of the vegetables, soup powder and Carnation Evaporated Milk. Mix well and simmer for 10 minutes, stirring occasionally until thickened. Pour into a casserole dish and cover with the puff pastry. Use the back of a fork to seal the pie all the around the edges (this also makes it look pretty) and brush the top with egg yolk. Bake until the pastry has risen and is a lovely golden brown.